Potted succulents cactus and a palm bring the look of a garden onto the finished patio. 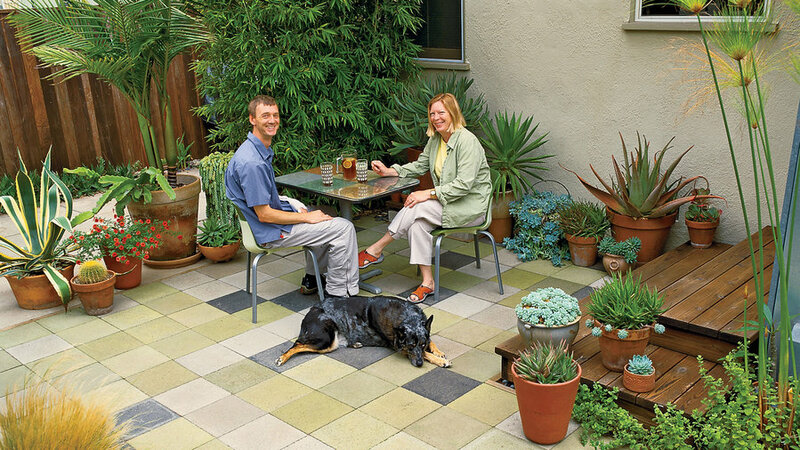 An outdoor “area rug” of stained concrete pavers replaced a tired lawn in the back of our 1930s bungalow in Santa Monica. And it solved a major, if temporary, problem. Because the back entrance of our house leads to a home office, lots of foot traffic had trampled the lawn. And our dog, Stella, regularly tracked grass and mud into the house. We needed a level, durable patio that would blend with the surrounding garden. But we didn’t want to commit to anything too permanent or expensive since we were rethinking the design of our house. Then my experience as a scenery artist led me to the idea of turning the raw 12-inch-square pavers into a colorful mosaic. After a few experiments, I developed a simple recipe that would allow me to stain the pavers with custom colors (see Project Tips on page 2). Unlike paints made specifically for concrete, this mixture lets you choose your own color palette. For our patio’s design, we copied the pattern of a 1950s tiled wall in the neighborhood; it uses four colors in the 13- by 13-foot design. After removing the lawn and about 3 inches of soil beneath it (the 2-inch-deep pavers needed to sit flush against an adjacent driveway), we framed the patio with 2-by-4s and put down a 1-inch-thick layer of washed sand. We positioned the pavers, which I’d already stained and sealed, and then used a carpenter’s level to make sure each one would sit level on the sand. We pounded them into place with a rubber mallet. To finish the patio, we put down more washed sand and swept it across the patio’s surface to fill in the cracks between pavers. The finished patio ― which we built in a long weekend for about $250 ― established an outdoor room that has become our favorite spot for alfresco dining. It makes an inviting “rug” for garden furniture and holds up beautifully to heavy foot traffic. (Maintenance consists of an occasional sweeping.) To keep the patio cool on warm days, we hang a shade sail overhead. Our paving technique would work equally well for building a garden path or for creating a small, safe pad for a portable firepit. Make a plan. 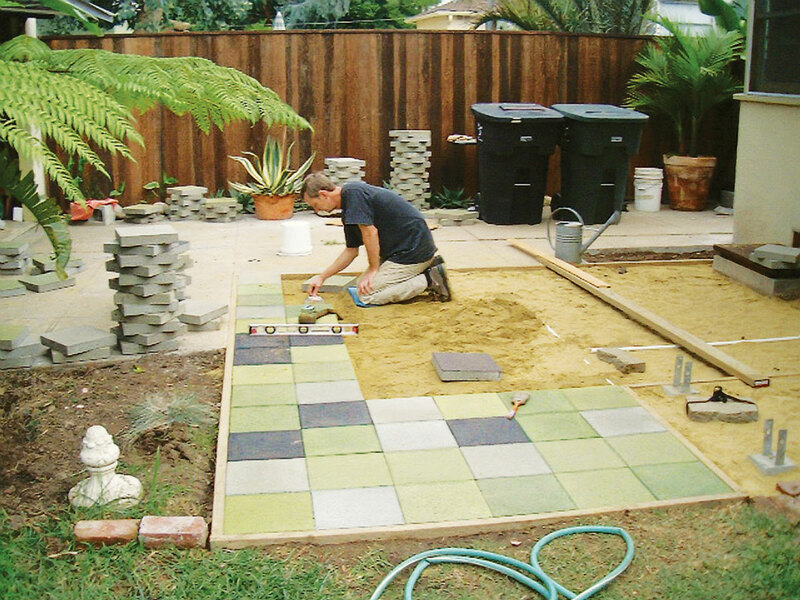 To figure out how many pavers you’ll need, measure the area where you want to locate your patio. Then, using colored pencil, work out your design on graph paper. The tile pattern pictured (“Retro”) is illustrated in the gallery, along with two other designs. Gather materials. You’ll need 12-inch-square concrete pavers; a drop cloth; wet-look concrete sealer (about 1 gallon for a 13- by 13-foot patio – choose one that resists mildew and grease); paint rollers and trays; paint buckets and stirring sticks; tinted flat exterior house paint (1 quart for each color); wood 2-by-4s for the frame; washed sand; carpenter’s level; and a rubber mallet. Mix your own stain. In a paint bucket, stir equal parts sealer, water, and water-based tinted flat exterior house paint. Pour mixture into another paint tray, and, using a different paint roller, apply one coat of the colored stain mixture on the pavers’ top surface. Let dry, about 10 minutes. Repeat with other colors. Seal the stain. To give the finish some gloss, apply two or more coats of concrete sealer; allow to dry.